Earth’s magnetic field does way more than guide our compasses and cause occasional worry. It’s part of the reason there’s life at all on this planet—it protects us from harmful solar radiation that might otherwise blow our ozone layer away. But there’s still a lot about the magnetic field scientists don’t understand. Most importantly, they’re having trouble figuring out why it’s so strong. One team decided to take a closer look at the role of the individual elements inside the planet that are thought to influence the field. 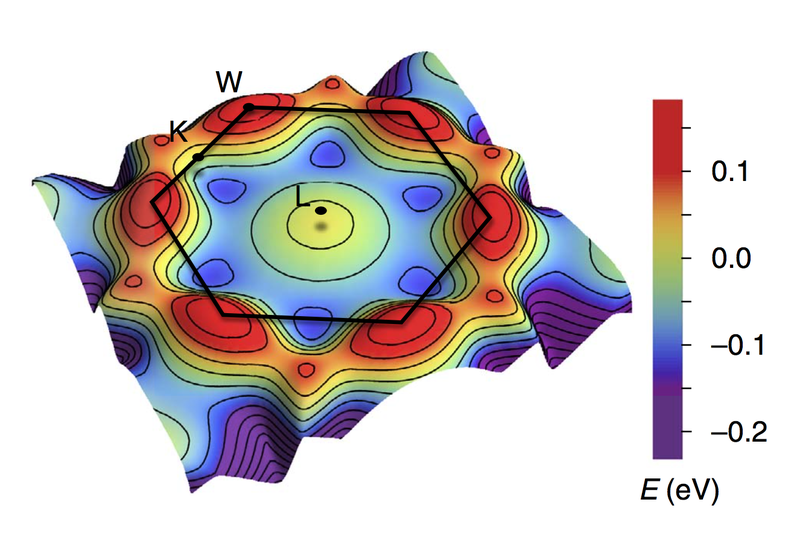 Turns out, the way nickel behaves at the smallest scales might help explain the magnetic field’s strength, to the point that some existing models would need to be rethought. And understanding the Earth’s magnetic field has implications for everything that relies on it, including activities that require drilling underground. “This is a new idea put into the geophysics research line that nickel has been neglected for the explanation of the geodynamo, the mechanism for creating the magnetic field,” study author Giorgio Sangiovanni from the Institute for Theoretical Physics and Astrophysics at the University of Würzburg in Germany told Gizmodo. At its most basic level, the Earth probably gets its magnetic field from temperature gradients in the outer core causing metal to convect—this is more or less the way water moves around in a pot of boiling water. Metals can conduct electricity. So, moving metals combined with Earth’s rotation could create tubes of electric current that point to the poles. Loops of electric current generate magnetic fields through them, so the entire Earth ends up looking like a magnet where the poles align with the tops and bottoms of the tubes. The problem, which people have been talking about for a while now, is that there’s another way for heat to transfer between elements around the core, conduction, that doesn’t require metals to physically move. In that case, the energy just gets passed between the atoms as they bump into one another, like how heat travels down the handle of the pot of water you’re boiling. But if the outer core loses too much heat through conduction, then there’s not enough energy to drive the convection creating the magnetic field. Scientists think that might be the case, and are looking for a source of extra energy that could generate the magnetic field they observe. Sangiovanni and his colleagues decided to make calculations about the metals in the inner core, to see if they could find some of the missing energy. But unlike the outer core, which is mostly iron, the inner core is 20 percent nickel. The team decided to examine how nickel and iron’s specific quantum mechanical properties in the Earth’s solid core impact the magnetic field. These properties aren’t fundamental enough to require you to bend over backward imagining Schrödinger’s cat. They describe the structure of nickel and iron atoms at high temperatures, how electrons interact in collections of these atoms, and how these elements’ behaviours change at high pressures. It turns out that nickel’s shape in a solid slows its electrons down. The electrons also interact and scatter off of each other, preventing nickel from being a good conductor of heat, according to the paper published yesterday in Nature Communications. Iron, meanwhile, has a high conductivity at the temperatures and pressures found in the inner core. In short, the researchers think nickel could reduce the overall conductivity of the core, causing it to retain extra energy that drives convection. And this new insight might have a large enough effect that models of the Earth’s magnetic field need some reconsidering. But the researchers’ findings can’t be taken as fact yet—they still need to calculate other properties relating to how nickel conducts heat. “But it is promising,” said Sangiovanni. “We’ll see after we calculate other important observables,” like the thermal and electrical conductivity.